We spent the morning planning and booking various meetings with entrepreneurs, bankers and authority officials. Then we made visits to three more companies. First, we visited Kuva in his clothing and shoe stores. 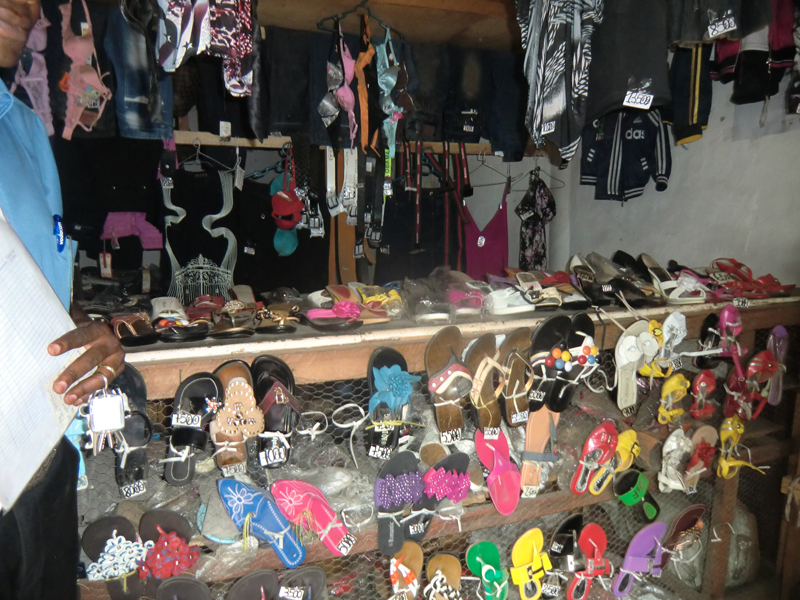 Since he joined our training and got a business loan he has opened a new store or rather doubled his retail space. The two stores are next door to eachother. He is investing in a youthful assortment of clothes and shoes, and the stores are situated on a street with a lot of people in motion. It seems to go well for Kuva and he is a happy and service oriented businessman. When we compare his budget with the outcome, he seems to be doing pretty well. With him, as with the others, we discussed the necessity of careful accounting and that a report must be sent to our local representative each month. Special forms for bookkeeping were handed over to him. He has one employee at the moment, and visions to expand his businesses. 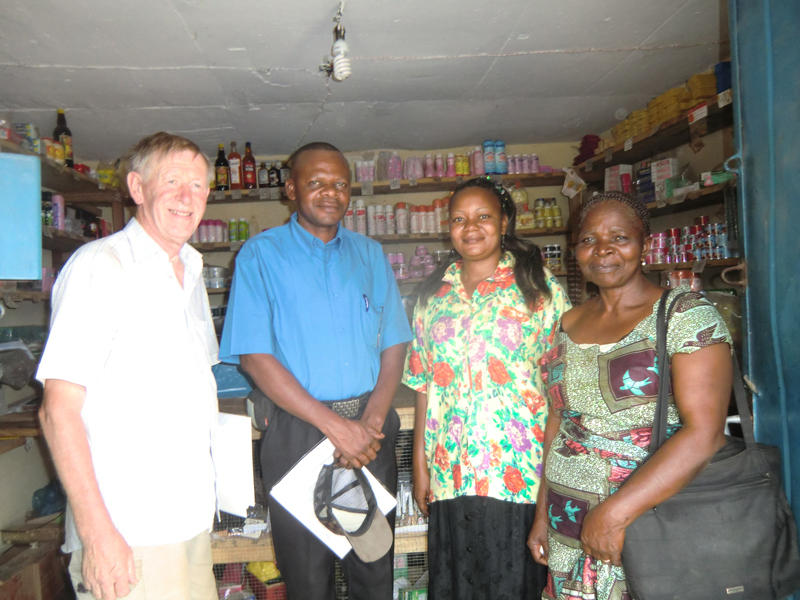 Next one store owner we visited was Lutete and his wife Brigitte. 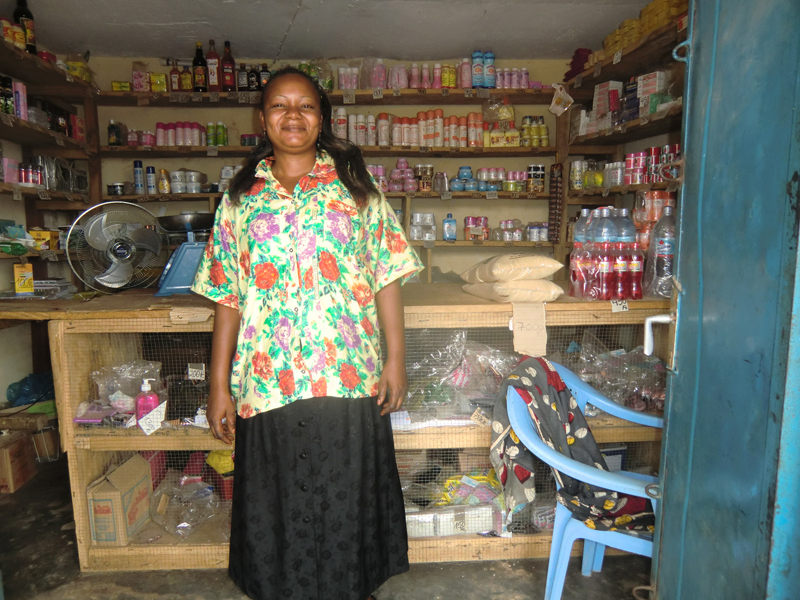 Lutete participated in the training, but his wife manages the shop, a family business. Lutete has another job as well. 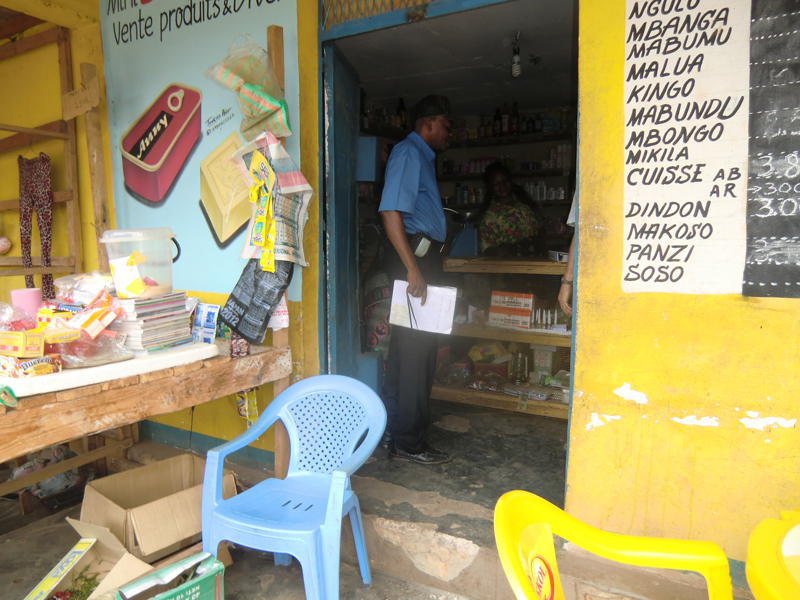 The shop is a mix of pharmacy and miscellaneous store. Budgeted revenue matches the outcome, and it is a good looking and nice store. When we left, Brigitte got a visit from the man who collects taxes and other fees. Many entrepreneurs complain about the tax collector. The taxes and fees seem to be arbitrary, therefore the business owner doubt the legitimacy of the tax collectors. Before he went to work Lutete strengthened himself with two beers, and we refreshed ourselves with soft drinks in the same cafeteria, next door to Brigitte. 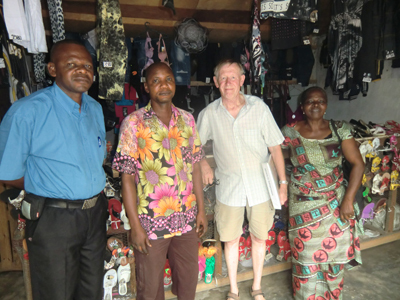 The third entrepreneur, Matondo, came to us and told us about his business. His earlier plan was to sell spare parts for cars, but he claims that the loan he received was too small to start the business. He has previously been a taxi driver and he has expanded this business instead. He recently bought an additional car and now he has three taxis. He wants to work in the taxi business until he has earned enough money to put his business idea about spare parts into practice. Profitability seems to be good and he seems to be a responsible and committed person who we believe will succeed. The afternoon we spent making necessary changes to the Nsanda Group. Several of the members in the group have been too passive, and cannot stay in the group. We summarized what had happened so far in the agricultural project and drew up guidelines for the future. Necessary repairs of machines must be done. The cultivated area will be expanded by 10 hectares. 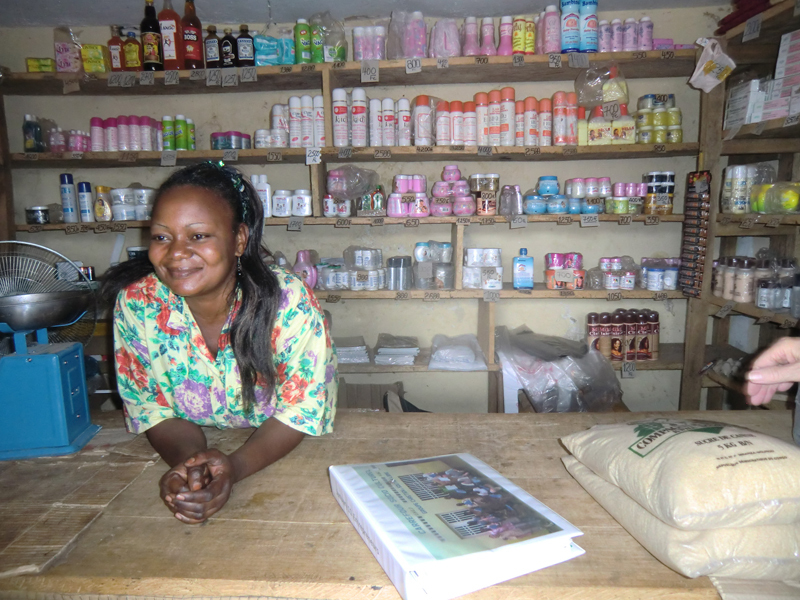 We calculated the amount of efforts needed before there are any incomes from marketable products. The participants in the Nsanda project will also get a plot where they can grow their own food. We hope for a good harvest of manioc which we hopefully will refine to increase the sales value. Later in the evening the number of Swedes increased with 100% here at Lisanga. Lars-Ola Rydberg and Lennart Fridén arrived. They had also brought two women from Brazzaville. They will be here this week and next. We will now work alongside our entrepreneurs. 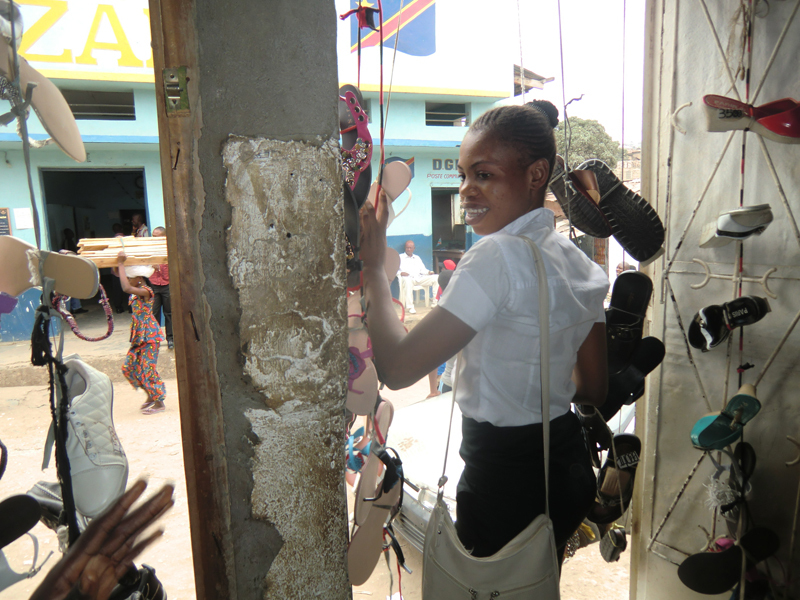 The women from Brazzaville are business economists and will be here in Matadi to follow and learn how we work. We hope that they too will work in Congo with entrepreneurial training in the future.